To Cite: Irandoust K, Taheri M. Effect of Peripheral Heart Action training and Yoga Exercise Training on Respiratory Functions and C-Reactive Protein of Postmenopausal Women, Women Health Bull. Online ahead of Print ; 6(2):e88027. doi: 10.5812/whb.88027. Objectives: The aim of this study was to evaluate the effect of peripheral heart action (PHA) and yoga exercises on respiratory functions and CRP of obese postmenopausal women. Methods: In this quasi-experimental study, 40 elderly women (age: 65.3 ± 2.6 years) referring voluntarily to the Sport Counseling Center of Sports and Youth Administration of Qazvin province in 2018 were randomly assigned to three groups: yoga exercise group (n = 14), strength training group (n = 13), and control group (n = 13). The experimental groups performed the exercise protocols (yoga and PHA training) three sessions a week each lasting 40 minutes for two months. Tests were performed to evaluate the subjects’ ventilatory capacity including FVC and FEV1 using spirometry and CRP. The tests were done in pre-test and post-test. Data were analyzed by SPSS software using the t-test, One-way ANOVA, and Tukey post hoc test. 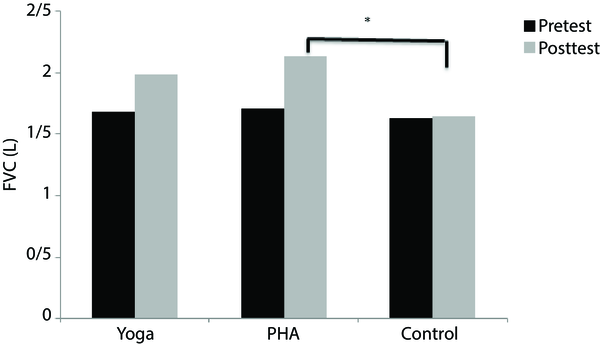 Results: FEV1 was better in the yoga and PHA exercise groups than in the control group (P = 0.001 and P = 0.016, respectively). Furthermore, CRP was better in the yoga and PHA training groups than in the control group (P = 0.001 and P = 0.02, respectively). There was no significant difference in the study variables between the two training groups (P = 0.97). Conclusions: Based on the obtained results, due to the vulnerability of the elderly to cardiorespiratory and inflammatory problems, it is highly proposed to apply such exercises to improve the physiological functions. Mortality from cardio-respiratory illness is prevalent in the elderly (1, 2). Aging creates many changes in the physiological, physical, and psychological functioning of aged populations that disturb the lifestyle and functional independence of the elderly (3, 4). The aging process imposes limitations on cardiorespiratory functions, which can reduce the capacity of people to tolerate exercise; it even causes respiratory diseases (5). Research evidence shows that the loss of respiratory function associated with impaired mobility results in a reduction in the use of environmental oxygen, thus decreasing the forced expiratory volume in elderly women and men and putting their cardiovascular system at potential risk (6, 7). Muscle weakness is more common in postmenopausal women, especially in those with overweight and obesity (8, 9). According to some studies, the strength of respiratory muscles in the elderly begins to decrease over time, which can also reduce the function of respiratory pump muscles (10, 11). Since there is a direct relationship between lung and heart function, any weakness in respiratory function may lead to changes in cardiovascular outcomes (12). In the same vein, overweight and obesity adversely affect inflammatory factors such as C-reactive protein (CRP) that is responsible for the development of cardiovascular disease (13). Based on research evidence, physical activity and exercise are effective in improving the respiratory function and reducing the risk factors associated with cardiovascular disease (14, 15). Accordingly, it seems that training adaptations and improved muscle mass and respiratory function in obese individuals can reduce inflammatory factors and decrease the risk of these diseases. A study by Irandoust and Taheri (16) showed that a yoga practice protocol significantly improved the static, dynamic, and lower limb muscle strength and flexibility of elderly women. Recently, researchers have been concerned about the effectiveness of exercises in improving the physical and physiological state of the elderly without putting stress on joints and skeletal systems. These exercises have included a combination of physical and mental exercises focusing on movement control, body positioning, and breathing. These resistance exercises emphasize mostly factors such as flexibility, power, breathing, and balance (16). Yoga is such a mind-body intervention that is increasingly being explored for therapeutic potentials in the elderly. In a study, it was indicated that about 15.8 million American people are involved in yoga training (17). This type of exercise, with its roots in ancient Indian philosophy, is used for physical, mental, and spiritual well-being. On the other hand, to the best of our knowledge, this is the first study that directly investigates the potential cardiorespiratory changes following engagement in particular resistance exercises such as peripheral heart action (PHA) training. This mode of training was initially introduced by Dr. Arthur Steinhaus in the 1940s. It was specifically designed to keep blood circulation throughout the whole body during the entire workout with few exercises (five to six) performed at low intensity (18). The logic of using these training methods is the interest of the elderly in such exercises, on the one hand, and some physical limitations that elders have in physical activity, on the other hand. Generally, since the elderly are unable to perform aerobic exercises and high-pressure exercises due to muscular atrophy and weakness of the skeletal system the aim of this study was to evaluate the effect of peripheral heart action (PHA) exercise and yoga exercise on respiratory function and CRP in obese postmenopausal women. The quasi-experimental study was conducted with the pre-test and post-test design. The sample size was calculated to include 40 individuals based on the error level of 0.05 and the probability of 0.8 (Equetion 1). In this study, 40 elderly women (age: 65.3 ± 2.6 years) referring voluntarily to the Sport Counseling Center of Sports and Youth Administration of Qazvin province in 2018 were randomly assigned to three groups: yoga exercise group (n = 14), strength training group (n = 13), and control group (n = 13). The inclusion criteria consisted of percent body fat of ≥ 35% and lack of smoking and any serious medical conditions such as stroke, diabetes, and heart attack preventing participants from adhering to the exercise protocol. Taking drugs during the study and absence in training sessions were the exclusion criteria. The present study was approved by the Ethics Committee of Imam Khomeini International University (Ref. no. 17628) and a consent form was signed by each participant prior to the beginning of the experimentation. The measurements of respiratory functions and CRP were carried out in two stages of pre-test and post-test. The experimental groups performed the exercise protocols (yoga and PHA training) three sessions a week each lasting 40 minutes for two months. The control group performed daily routine activities. The exercise protocols were performed by professional trainers under the supervision of an exercise physiologist. The exercise protocols for PHA (19) and yoga (16) training are seen in Table 1. Abbreviations: 1RM, one-repetition maximum; Rep, repetition. Blood samples were collected by venipuncture from the forearm vein after the subjects were sitting at a rest position for 15 minutes. Serum CRP concentration was determined using Pars-Azmun kits by the Immunoturbidimetric method (20). Ventilation capacity (VC) and forced vital capacity (FVC) were assessed using a spirometer (Cosmed Pony FX Spirometer) in order to measure the respiratory functions of participants (21). Lean body mass (LBM), percent body fat (PBF), and WHR of the participants were measured using a body composition analyzer (ZENUS 9.9 PLUS Model). The study was approved by the Ethics Committee of Imam Khomeini International University (Ref. No. 17628). Data are presented as means ± SD in tables and texts. The normal distribution of data was assessed using the Shapiro-Wilk test. Data were analyzed by t-test, One-way ANOVA, and Tukey post hoc test for multiple comparisons. The significance level was set at P ≤ 0.05. As shown in Table 2, 40 obese postmenopausal volunteers participated in the study with a mean age of 65.3 ± 2.6 years. The mean weight of participants was as follows: 77.6 ± 3.9 vs. 75.7 ± 3.96 kg in the yoga training group, 75.43 ± 6.01 kg in the PHA exercise group, and 76.77 ± 6.44 kg in the control group respectively in pre-test and post-test. No significant difference was seen in the baseline values (P ≥ 0.05). The distribution of data was recognized as normal using the Shapiro-Wilk test (P = 0.61). One-way ANOVA results showed no significant difference in any of the cardiopulmonary variables in the pre-test stage between the groups (P = 0.44). However, there was a significant difference in FVC, FEV1, and CRP variables between the groups in post-test (P = 0.003). Moreover, there was a significant difference between the groups in the body composition (P = 0.03). The Tukey test results of the variables are presented in Figures 1-3. Figure 1. Comparison of FVC in the study groups before and after the intervention (Tukey post hoc test). * significant difference between the PHA and control groups. Figure 2. Comparison of FEV1 in the study groups before and after the intervention (Tukey post hoc test). * significant difference between the PHA and control groups. # Significant differences between yoga and control groups. Figure 3. Comparison of CRP in the study groups before and after the intervention (Tukey post hoc test). * significant difference between the PHA and control groups. # Significant differences between the yoga and control groups. As shown in Figure 1, Tukey post hoc test results showed that the FVC variable was significantly better in the PHA training group than in the control group (P = 0.008); however, no significant difference was observed between the other groups (P = 0.12). 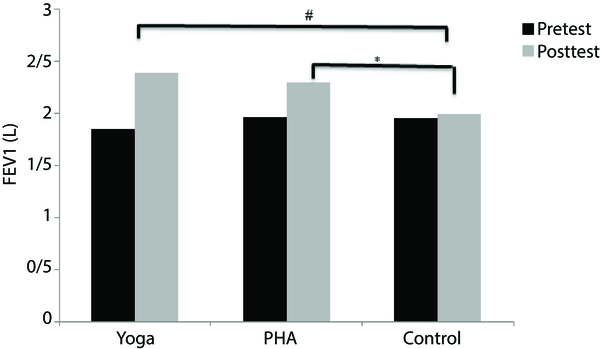 As shown in Figure 2, the results of Tukey post hoc test showed that the FEV1 variable was better in the yoga training group and the PHA exercise group than in the control group (P = 0.001, P = 0.016, respectively), but there was no significant difference between the two training groups (P = 0.97). 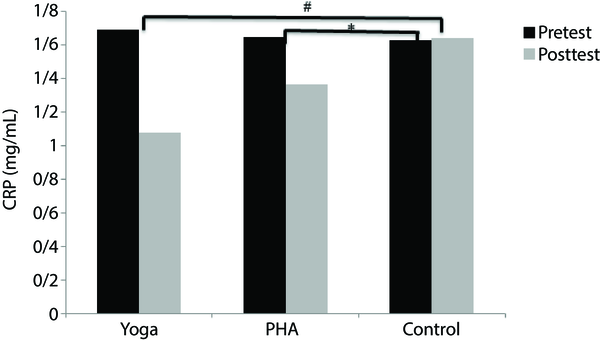 As shown in Figure 3, the results of Tukey post hoc test showed that the CRP variable was better in the yoga and PHA training groups than in the control group (P = 0.001, P = 0.02, respectively), but there was no significant difference between the two training groups (P = 0.08). The results of the Tukey post hoc test regarding the lean body mass variable showed that the yoga training group was better than the control group (P = 0.014). However, no significant difference was observed in other variables between the groups (P = 0.13). Considering the health-related risk factors among the elderly, providing healthy options has yielded a great deal of interest among health researchers. The purpose of this study was to evaluate the effect of PHA and yoga training on respiratory functions and CRP in obese postmenopausal women. The results showed that the PHA training resulted in a significant improvement in all respiratory factors (FVV, FEV1, and CRP). In justifying the obtained results, it can be noted that based on research evidence, the effectiveness of these exercises has been well documented on the regulation of hypertension (19). Thus, it is logical that the improvement of respiratory function may occur as a consequence of this exercise (22). The strengthening of respiratory muscles in PHA exercises is another factor explaining this result. Piras et al. reported in a study that PHA exercises could improve cardiovascular adaptations, reduce the sympathetic activity of the vessels, and improve parasympathetic status; moreover, less oscillation of systolic blood pressure occurs as a sign of sympathetic regulation (18, 19, 23). The other results indicated the improvement of FEV1 and CRP after exercise interventions. These positive changes can be attributed to Pranayama exercises (respiratory techniques) and Asana exercises (physical condition) (10). Pranayama exercises can affect pulmonary capacity and improve diaphragm performance by increasing the amount of respiration (22). As shown in the results, LBM was significantly better in the Yoga group than in the other groups, which could also justify better cardiopulmonary function. This result is consistent with the findings of Bezerra (10) that showed yoga improved respiratory function in the elderly. They stated that breathing exercises in yoga training keep the diaphragmatic muscles in contraction and increase their strength. On the other hand, the development of inspiratory muscles improves the function of expiratory muscles, which justifies the results. Of the limitations of this study were the low number of participants and the lack of the physiological assessment of hormonal factors involved in cardiovascular processes. A comprehensive study regarding the psychological and physiological aspects can strengthen such a study. Given that elderly people suffer impaired respiratory function due to physiological changes and body composition, as well as muscle atrophy and inflammatory factors, it is highly suggested that both PHA and yoga exercises be performed to improve their physical and physiological condition. This study was sponsored by Imam Khomeini International University. We appreciate those who participated in this study. Authors' Contribution: Study concept and design: Khadijeh Irandoust; analysis and interpretation of data: Morteza Taheri; statistical analysis: Khadijeh Irandoust; drafting of the manuscript, critical revision of the manuscript for important intellectual content: Morteza Taheri. Conflict of Interests: The authors state that there is no conflict of interests in this research work. Ethical Approval: The present study was approved by the Ethics Committee of Imam Khomeini International University (Ref. no.17628). Patient Consent: A consent form was signed by each participant prior to the beginning of the experimentation. 1. Carmo CN, Hacon Sde S, Jacobson Lda S, Mourao Dde S, Ignotti E. Mortality due to cardiorespiratory diseases in elderly people in Mato Grosso state, 1986 to 2006. Rev Saude Publica. 2010;44(6):1112-9. doi: 10.1590/S0034-89102010005000043. [PubMed: 21109906]. 2. Watt GC, Hart CL, Hole DJ, Smith GD, Gillis CR, Hawthorne VM. Risk factors for cardiorespiratory and all cause mortality in men and women in urban Scotland: 15 year follow up. Scott Med J. 1995;40(4):108-12. doi: 10.1177/003693309504000403. [PubMed: 8787109]. 3. Amini M, Mirmoezzi M, Salmanpour M, Khorshidi D. Eight weeks of aerobic exercises improves the quality of life in healthy aged sedentary men. Int J Sport Stud Health. 2018;10(2). doi: 10.5812/intjssh.67514. 4. Rodrigues-Rodrigues T, Gomes AC, Neto GR. Nutritional status and eating habits of professors of health area. Int J Sport Stud Hlth. 2018;1(1). doi: 10.5812/intjssh.64335. 5. Marek W, Marek EM, Muckenhoff K, Smith HJ, Kotschy-Lang N, Kohlhaufl M. Lung function in our aging population. Eur J Med Res. 2011;16(3):108-14. doi: 10.1186/2047-783X-16-3-108. [PubMed: 21486723]. [PubMed Central: PMC3352207]. 6. Vaz Fragoso CA, Gill TM. Respiratory impairment and the aging lung: A novel paradigm for assessing pulmonary function. J Gerontol A Biol Sci Med Sci. 2012;67(3):264-75. doi: 10.1093/gerona/glr198. [PubMed: 22138206]. [PubMed Central: PMC3297762]. 7. Lowery EM, Brubaker AL, Kuhlmann E, Kovacs EJ. The aging lung. Clin Interv Aging. 2013;8:1489-96. doi: 10.2147/CIA.S51152. [PubMed: 24235821]. [PubMed Central: PMC3825547]. 8. Agostini D, Zeppa Donati S, Lucertini F, Annibalini G, Gervasi M, Ferri Marini C, et al. Muscle and bone health in postmenopausal women: Role of protein and vitamin D supplementation combined with exercise training. Nutrients. 2018;10(8). doi: 10.3390/nu10081103. [PubMed: 30115856]. [PubMed Central: PMC6116194]. 9. Makara-Studzinska MT, Krys-Noszczyk KM, Jakiel G. Epidemiology of the symptoms of menopause-an intercontinental review. Prz Menopauzalny. 2014;13(3):203-11. doi: 10.5114/pm.2014.43827. [PubMed: 26327856]. [PubMed Central: PMC4520365]. 10. Bezerra LA, de Melo HF, Garay AP, Reis VM, Aidar FJ, Bodas AR, et al. Do 12-week yoga program influence respiratory function of elderly women? J Hum Kinet. 2014;43:177-84. doi: 10.2478/hukin-2014-0103. [PubMed: 25713658]. [PubMed Central: PMC4332178]. 11. Britto RR, Vieira DSR, Botoni FA, Botoni ALAS, Velloso M. The presentation of respiratory failure in elderly individuals. Curr Geriatr Rep. 2015;4(2):166-73. doi: 10.1007/s13670-015-0130-0. 12. Janssens JP, Pache JC, Nicod LP. Physiological changes in respiratory function associated with ageing. Eur Respir J. 1999;13(1):197-205. doi: 10.1183/09031936.99.14614549. [PubMed: 10836348]. 13. Cozlea DL, Farcas DM, Nagy A, Keresztesi AA, Tifrea R, Cozlea L, et al. The impact of C reactive protein on global cardiovascular risk on patients with coronary artery disease. Curr Health Sci J. 2013;39(4):225-31. [PubMed: 24778862]. [PubMed Central: PMC3945266]. 14. Warburton DE, Nicol CW, Bredin SS. Health benefits of physical activity: The evidence. CMAJ. 2006;174(6):801-9. doi: 10.1503/cmaj.051351. [PubMed: 16534088]. [PubMed Central: PMC1402378]. 15. Agarwal SK. Cardiovascular benefits of exercise. Int J Gen Med. 2012;5:541-5. doi: 10.2147/IJGM.S30113. [PubMed: 22807642]. [PubMed Central: PMC3396114]. 16. Irandoust K, Taheri M. The impact of yoga and pilates exercises on older adults. Salmand. 2016;11(1):152-61. doi: 10.21859/sija-1101152. 17. Macy D. Yoga journal releases 2008 “Yoga in America” market study. Yoga J. 2008. 18. Piras A, Persiani M, Damiani N, Perazzolo M, Raffi M. Peripheral heart action (PHA) training as a valid substitute to high intensity interval training to improve resting cardiovascular changes and autonomic adaptation. Eur J Appl Physiol. 2015;115(4):763-73. doi: 10.1007/s00421-014-3057-9. [PubMed: 25428724]. 19. Nabilpour M, Irandoust K. [The effect of peripheral heart action on body composition and blood pressure in people with high blood pressure]. Urmia Med J. 2018;29(3):174-82. Persian. doi: 10.5812/intjssh.81874. 20. Bijeh N, Hosseini SA, Hejazi K. The effect of aerobic exercise on serum C-reactive protein and leptin levels in untrained middle-aged women. Iran J Public Health. 2012;41(9):36-41. [PubMed: 23193504]. [PubMed Central: PMC3494213]. 21. Irandoust K. The effects of selected aerobic exercises on pulmonary functions of high school obese girls. Int J School Health. 2015;2(4). doi: 10.17795/intjsh29288. 22. Saul JP, Berger RD, Albrecht P, Stein SP, Chen MH, Cohen RJ. Transfer function analysis of the circulation: Unique insights into cardiovascular regulation. Am J Physiol. 1991;261(4 Pt 2):H1231-45. doi: 10.1152/ajpheart.1991.261.4.H1231. [PubMed: 1928405]. 23. Nabilpour M, Mayhew J. Effect of peripheral heart action on body composition and blood pressure in women with high blood pressure. Int J Sport Stud Health. 2018;1(2). doi: 10.5812/intjssh.81874.